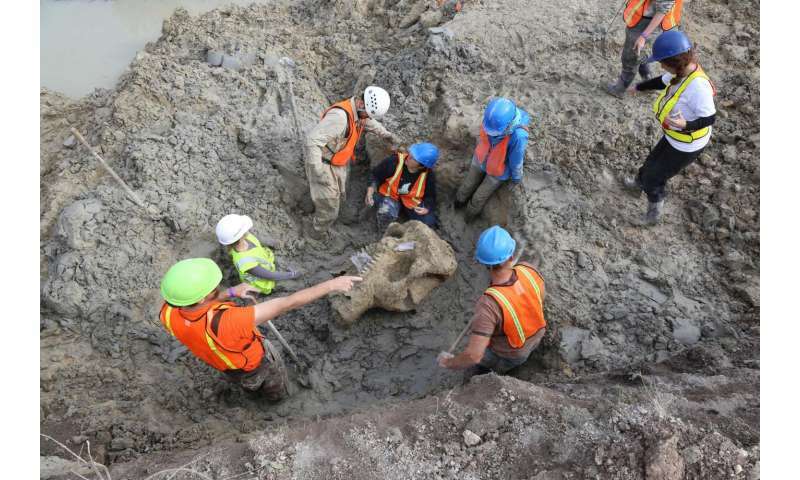 More than 75 complete or nearly complete bones, accounting for 60-70 percent of the extinct mammal's skeletal mass, were recovered during the four-day dig at the Fowler Center for Outdoor Learning near Mayville, in Michigan's Thumb region. The dig ended Sunday. Most of the animal's long limb bones, both shoulder blades, the entire pelvis, the skull, many vertebrae and most of the ribs were recovered. The tusks, the lower jaw and most of the foot bones were not found. Mastodons are extinct relatives of the elephant. Over the decades, pieces from roughly 300 mastodons have been found in Michigan. But fewer than 10 of those specimens are as complete as the one recovered in Mayville, said Daniel Fisher, director of the U-M Museum of Paleontology and leader of the dig. "This is the most complete Michigan mastodon skeleton in many decades," said Fisher, who is also a professor in the U-M Department of Earth and Environmental Sciences and in the Department of Ecology and Evolutionary Biology. 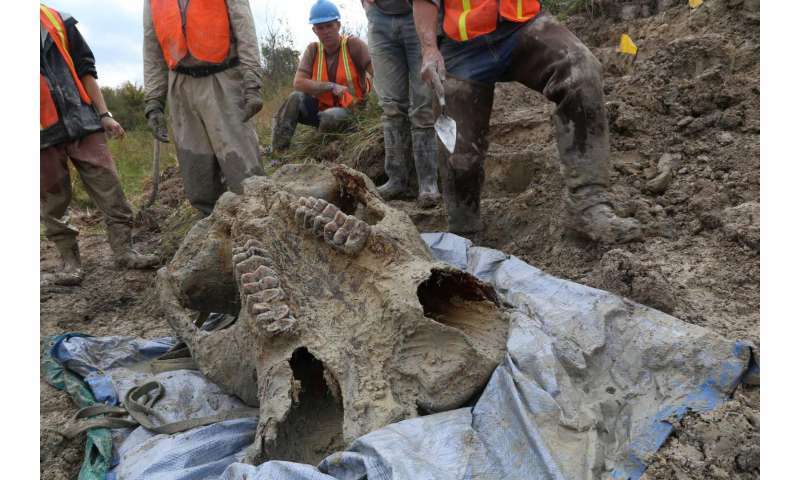 "I think the last time a mastodon this complete was found in Michigan was in the 1940s. That was the Owosso mastodon, the mature female skeleton mounted at the U-M Museum of Natural History. As I recall, she was about 80 percent complete." The excavation was a joint project between U-M and the Fowler Center. The dig team included 10 Tuscola County teachers, as well U-M undergraduate and graduate students and staff members from the school's Museum of Paleontology and its Museum of Natural History. The bones have been donated to the Museum of Paleontology for further study. The specimen will be known as the Fowler Center Mastodon. This individual was a male believed to be about 30 years old at the time of death, based on the stage of its molar development and wear. It probably lived 11,000 to 13,000 years ago; a radiocarbon age analysis will be conducted to pin down the date to within a century or less, Fisher said. The Fowler Center bones were discovered two years ago eroding from a stream bank. Preliminary studies of the initial bones suggested that the mastodon's carcass may have been processed by early human hunters or scavengers, Fisher said. The work conducted this month supports that idea, he said. "I would say it is roughly 80 percent likely that humans were involved and responsible for major portions of what we see at this site," Fisher said. "The preponderance of evidence favors this interpretation." Some of the recovered bones were fully articulated when found, meaning they remained in the same positions, relative to each other, as when the animal was alive. Some fully articulated sections were separated from other parts of the carcass, as if placed in separate piles. Such a pattern is unlikely to develop when a large animal dies of natural causes and its carcass is exposed to the elements, Fisher said. In that case, scavengers typically pick apart the carcass and scatter the bones. At the Fowler site, it looks like early human hunters or scavengers may have stored mastodon meat at the bottom of a pond that no longer exists, Fisher said. The bones were preserved in fine-grained pond sediments believed to have been deposited at the close of the last ice age. The cold, low-oxygen environment of the pond bottom would have helped preserve the mastodon meat. Fisher said he has previously investigated more than a dozen of these prehistoric pond-storage sites in the Great Lakes region. In Ann Arbor, members of Fisher's team will wash the bones and examine them for cut marks and other evidence of human butchery, or any other kind of postmortem modifications. In addition to the radiocarbon analysis, roots of one of the animal's wisdom teeth will be examined using microCT and growth-increment analyses to determine season of death. U-M researchers and Fowler Center staff members decided to invite local teachers to be part of this month's dig as a way to share the discovery with the surrounding community. In addition, many locals gathered at the dig site this month to watch the excavation's progress. "A big part of the Fowler Center's mission is to enhance personal growth through outdoor adventures that provide an opportunity for learning by doing. And that's exactly what this partnership with local teachers and U-M researchers is all about," said Kyle Middleton, executive director of the Fowler Center.